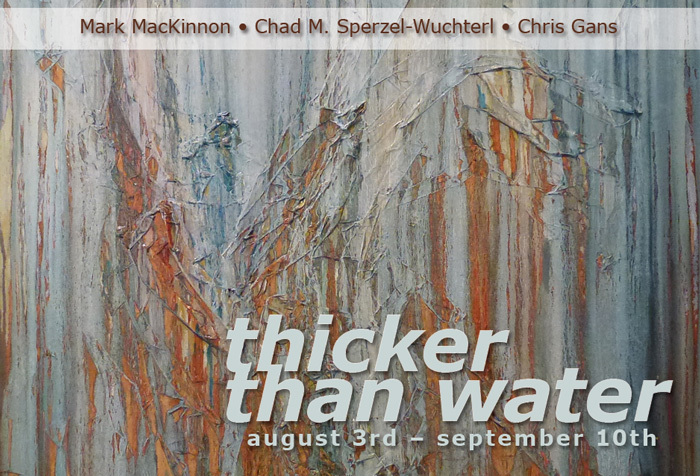 Park Schreck Gallery is pleased announce the upcoming show Thicker Than Water, featuring work by Mark MacKinnon, Chad M. Sperzel-Wuchterl, and Chris Gans. Mark MacKinnon exhibited with Park Schreck Gallery last year. The response to his work was so great that it was a given that he would show again at the gallery. Mark is a master at taking photos of picturesque vistas or objects and turning those photographs into amazing pieces of art! Chad M. Sperzel-Wuchterl is multi-talented. He creates highly textural abstract works on canvas as well as handsome and hip oil paintings on paper. Chad’s subdued earth tones make it difficult to tell if he is using paint or carving from natural materials. Chris Gans is new to the gallery and an exciting edition. Inspired by his studies in forensic science, Chris’s work involves some awesome chemistry, providing a fluidity and color that is exceptional. His process, like his work, is fascinating. Needs to be experienced in person! The gallery is open to the public 11am–6pm (Thursdays until 8pm), Sundays 12–5pm, and closed on Tuesdays. Park Schreck Gallery finds talented emerging artists and connects them with buyers who are looking for original works of art. Amazing art, great value. This entry was posted in Call for Artists and tagged art, Chicago, Park Schreck Gallery. Bookmark the permalink.